On April 14th 2010, the ash cloud from an Icelandic volcano closed European airspace. 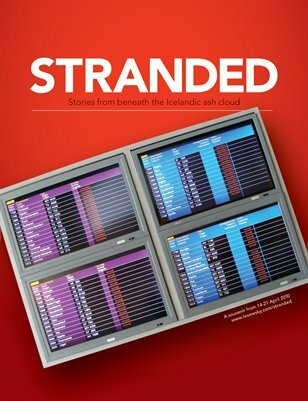 Thousands of people were stranded all over the world. Andrew Losowsky was one of them, stuck in Dublin, trying get to the States. A few days in, he had an idea. He put out a call for others stranded around the world and invited them to make a magazine. And so, Stranded. Designed by Matt McArthur (from Edinburgh, stuck in New York), it's filled with true stories and amazing visuals, including volcano cocktails from around the world, the thoughts of a famous vulcanologist, a horror story set inside the ash cloud, 54 journalists in a 16-hour race to catch a boat, a chance encounter with a cute Parisian waiter, a playlist for abandoned airports, and much more. The total price is the production cost plus $5, which goes directly to the International Rescue Committee to help people stranded in a more permanent way.